Tag Archive | "Green Terror Cichlid (Aequidens rivulatus)"
The Green Terror Cichlid (Aequidens rivulatus) is a South American river cichlid found primarily in the Rio Tumbes in Peru, and the Rio Esmeraldas in Ecuador. Green Terror Cichlids are collected from over a variety of substrates that include mud, sand, gravel, large river rocks, and even thickly layered beds of dead leaves. They are found in both rapid and slow moving waters, at temperatures of 68 to 80 degrees, and in pH conditions of 7.0 to 8.4. Juvenile Green Terror Cichlids are usually collected along the shallows and backwater areas of the rivers, while adults prefer the deeper portions. The Green Terror is a gorgeous cichlid that belies it’s common name. They are relatively peaceful and known for becoming quite friendly with their keepers. 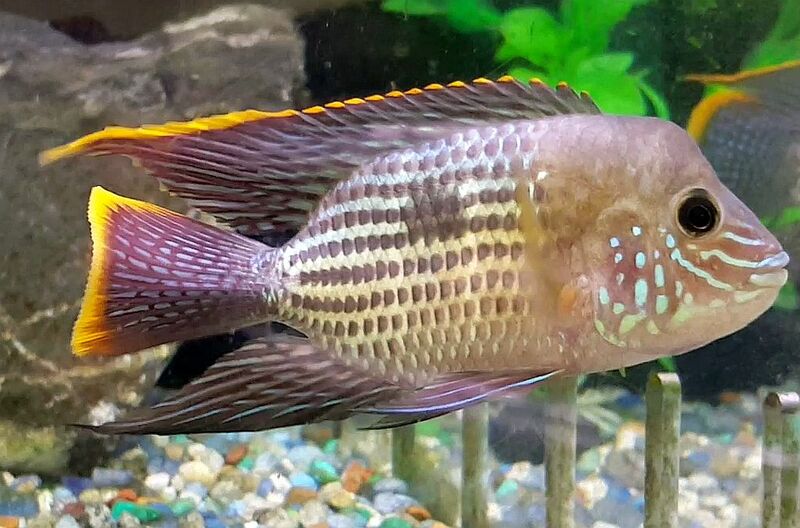 Green Terror Cichlids have a greenish white to olive green body that is speckled an iridescent blue green, with electric blue spots on the chin area, dorsal and caudal fins that are edged in an orange to reddish pink color, and a black spot at mid body. The pectoral fins are usually colored orange or yellow, with some specimens appearing to have a slight turquoise hue on the body. Mature males have a nuchal hump and longer flowing tails than the females, but both sexes display the black spot at mid body. Female Green Terror cichlids are smaller than males and although they have the same color pattern, are not as brightly colored. They tend to be more of a olive drab color. Green Terror Cichlids do best in an aquarium of at least 55 gallon capacity with a sandy or fine gravel substrate, rock work formed into caves, shelters and hiding spots, some driftwood roots, some hardy, tough leaved aquatic plants like Anubias and plenty of free swimming space. These fish are active “diggers” so ensure that the plants provided are well rooted or potted. Pristine water quality is also a requirement for these cichlids, so a good filtration system and frequent partial water changes are mandatory. Canister filters provide excellent filtration and the water flow necessary for keeping these fish healthy. The Green Terror is generally peaceful with other fish of similar size and disposition, but does become more territorial as it matures. Green Terror Cichlids are open breeders that will spawn in a wide range of water conditions. They readily pair off and although the female plays a bigger role in raising the fry, both parents aggressively guard the eggs and their offspring. Because many cross bred specimens are sold to tropical fish keeping enthusiasts as Green Terrors, the challenge for breeding them is to obtain pure breeding pair stock. When ready to breed, the female will either lay between 300 to 400 eggs on the substrate or select and clean off a flat rock to deposit her eggs on. Depending on water temperature, the eggs will hatch out in 2 to 3 days. The parents will move the newly hatched fry into fanned out pits in the substrate and usher them around until they become free swimming in about 5 days. Feed the fry newly hatched brine shrimp or crushed flake food until they are able to care for themselves. The parents will continue to care for the fry for several weeks unless they are removed from the tank. These fish are prolific breeders and will spawn about every two weeks if the young are removed from the aquarium, so make sure you have a place to keep them. Green Terror Cichlids have a voracious appetite and will eat almost anything placed into their tank. Although they prefer meaty foods, they will eat fresh, frozen, freeze dried, flakes or Cichlid pellets including house flies, small earthworms , small mysis shrimp , ghost shrimp, bloodworms, krill, tubifex, ocean plankton, brine shrimp, etc. Aequidens rivulatus is common in the aquarium trade and available for purchase to tropical fish keeping enthusiasts as juveniles when they are 2″ to 3″ in length, or as adults at reasonable prices. Max Size: Males 10-12″, Females 7-8?